“The best way to predict the future is to create it.” Keeping this in mind, a Career Confluence was held at J M International for students of classes IX to XII from 9:30 AM to 1:00 PM on 23rd October 2017.The fair was organised by Jitin Chawla Center for Career Development with the aim of letting the students choose their career path and clear their doubts while choosing the desired carreer. 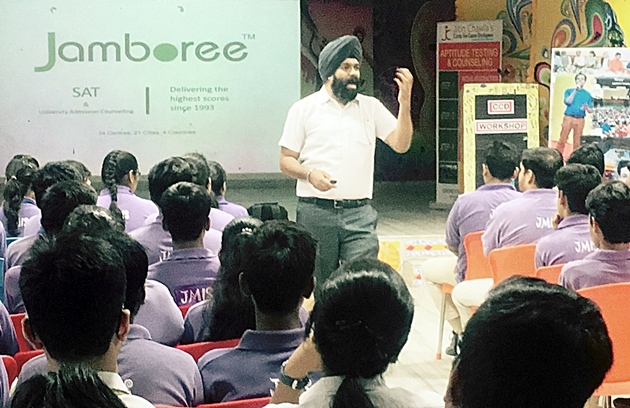 Mr. Harpreet Singh, General Manager of Jamboree Education Pvt Ltd also conducted a workshop especially for students who want to pursue higher studies abroad. The workshop talked in length about the admission procedure of numerous foreign universities. It also shed light on various exams like SAT, IELTS, and TOEFL. Another workshop was conducted by Dr. Ishan Ranjan which apprised about the various ways to crack competitive exams. He also stressed on the importance of time management. The career fair too proved to be extremely informative, in which various Indian and foreign universities had their stalls and the students were given pamphlets and flyers informing them about the various courses. The career fair was a huge success guiding students for their bright future.